A filling is a type of restoration which replaces tooth structure that has deteriorated due to tooth decay or wear or that repairs small tooth fractures. A common need for a filling occurs when your enamel breaks down due to decay. Upon examination, your dentist diagnoses the decay and declares that you have a “cavity”. It’s called a cavity because removal of the decay leaves a cavity or hole in the tooth. The pit or hole that is left needs to be “filled”. If the tooth is relatively intact when the decay has been removed (depends on the extent of decay) a filling is an excellent choice to restore it. What is tooth decay and how did I get it? Tooth decay occurs when bacteria in the mouth produce a sticky, nearly invisible substance called plaque. This bacteria-laden substance continually forms on your teeth and gums and feeds on the sugars in your diet; in turn producing acids and toxins that destroy your tooth enamel. This process is called demineralization. The destruction of tooth enamel is called decay. We refer to decay as a “cavity”. 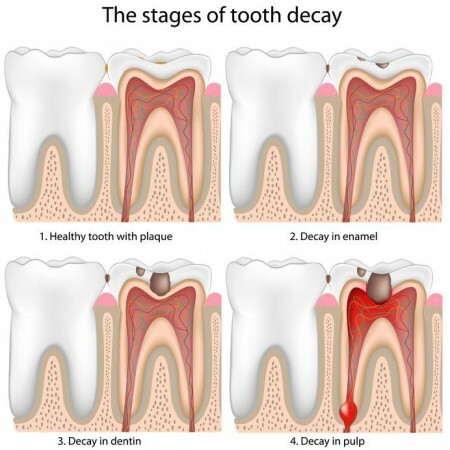 Decay can spread to the dentin and eventually into the pulp or nerve of the tooth necessitating root canal treatment. Tooth decay is influenced by many aspects of your lifestyle. Factors such as diet, oral hygiene, preventive dental care practices, the presence of fluoride in the water supply, and even the toothpaste you use can affect the likelihood of decay. Genetics is another factor in determining how susceptible your teeth are to decay. Tooth decay is one of the two biggest threats to your dental health and should be taken seriously. Cavities left untreated can destroy your tooth and its nerve. Small cavities are treated with fillings. More severe decay resulting in larger and/or deeper cavities may require restoration with a crown or a root canal. Extreme cases left untreated can mean the loss of your tooth and the need for an implant or bridge. Coronal cavities occur on the chewing surfaces or between the teeth. Coronal cavities are more common among children, but adults are also susceptible. Root cavities occur when gum recession exposes the roots to plaque. Because the root is not covered by enamel, cavities can form quite rapidly at the root. Recession is more common as we age. Recurrent decay forms around dental restorations such as fillings and crowns. These restorations have the tendency to accumulate plaque and so are susceptible to cavities. Regardless of where decay occurs, early detection is important. Regular preventive care visits (Link to What happens during a preventive dental care appointment?) will ensure that decay is identified and treated in its earliest stages. My entire family has been coming to Dr. Crabtree for over 15 years. The staff is always courteous and gets to know you on a personal basis. Dr. Crabtree has always taken care of me and takes the time to explain things to me. Always a pleasant experience. Why would I need a dental filling? You may need a filling if you have a tooth that is sensitive to sweets or cold temperatures, but it’s also possible not to have any symptoms at all. Often decay has no symptoms, in which case only a dentist can tell you it is present. Sometimes it will be visible as a shadow on a dental x-ray. If you have decay it is important to get it removed and the cavity restored quickly so that it doesn’t spread to more of your tooth. The more tooth structure is lost to decay or fracture the more likely it is that you will need another solution such as a crown. Keeping regular dental appointments where your teeth are cleaned and examined is the ideal way to ensure that cavities are caught while they are small. At Crabtree Dental we utilize cavity detection lasers and software, special technologies that deliver the electronic equivalent of a second opinion. These devices allow our dentists to detect decay at its earliest stages. In some cases, a filling is needed not to restore the tooth from decay but from trauma or extra space. For more information about this kind of filling, also called “bonding”, see What are the cosmetic applications of composite resin fillings or dental bonding? What material will my tooth be “filled” with? Teeth can be filled with a couple of materials, but the material of choice over the last decade is increasingly composite resin. Composite resin is made from a composite of plastic and glass that is bonded to the tooth and light cured to be super strong. You may have heard the term “bonding” before. This is where the term “bonding” comes from when referring to tooth-colored fillings. Any filling material needs to be strong to stand up to the forces of chewing and must adhere to the tooth even in the presence of saliva. When a dentist fills your tooth they directly place the composite material in the cavity to restore it. As the material is placed, it is shaped to match natural tooth anatomy as closely as possible. Many years ago, the material most often used to fill a tooth was called amalgam and it looked silver in color. Nowadays people prefer composite filling materials because they come in tooth-colored shades making filling restorations appear more natural. All new fillings placed at Crabtree Dental are made from composite resins. Over time as existing silver fillings breakdown or as people decide they want to have more natural looking restorations, amalgam fillings are also being replaced with composite resin fillings. Dental restorations placed with the main intention of improving the form and function of your teeth should match your adjacent teeth as closely as possible. Our dentists strive to make every dental restoration as lifelike and aesthetically pleasing as possible. You can expect that all the general dental services offered at Crabtree Dental will be performed with the goal of maintaining an eye to matching the aesthetics of your adjacent teeth and improving on them where possible and desirable. What are the cosmetic applications of composite resin fillings or dental bonding? If you are unhappy with gaps or spaces between your front teeth (the gap between two teeth is called a diastema); bonding can be a solution for you. Composite resin that closely matches your tooth color can be added to each tooth on either side of the gap to close the space. Depending on the size of the gap, or if you have multiple gaps between several teeth, porcelain veneers might be a better solution. After you have been evaluated we will provide options to meet your particular needs. The benefit of bonding to close a diastema is that it can be completed in a single appointment and for the most part it is a reversible procedure as little if any tooth preparation is necessary. While the fee for bonding is substantially less than that of a veneer, it is not always the best solution. This is because the composite resin material will chip and change color over time, necessitating a need for replacement bonding. For many patients bonding is a good interim solution; but for the best long term solution porcelain veneers are more durable and aesthetic. Sometimes life throws you a curveball – right in the teeth! Particularly among youth involved with sports, the most common dental injuries involve trauma to the front teeth. Trauma such as this will commonly result in the front teeth being chipped or sheared off. These accidents are not only physically traumatic but also emotionally upsetting as the patient and parent see the physical damage to the smile. One of the most rewarding procedures dentists can perform is restoring the patients smile by bonding composite resin to the remaining tooth remnants and shaping them to match the original teeth. In a single visit the tooth can be built up again and restored to look as good as new. In most situations, the bonded tooth will hold for many years. If the nerve is exposed when the tooth is broken, root canal therapy may be necessary before the tooth is restored. Most youth under 18 years of age are not good candidates for porcelain veneers or crowns because the nerve inside their tooth is still large and the tooth is settling into position as they grow and mature. As the child ages, the tooth or teeth will be evaluated for a better long-term solution. If you or your child is involved in such an accident, call our office as soon as possible including after hours.